One of America’s biggest hidden tragedies is suicide. When I was growing up in the 1950s, it was a virtually forbidden topic. When I began working as a news reporter in the 1970s, I bumped into a tradition in journalism that suicides were not reported. When a Vietnam veteran in a small town I covered as a community news reporter killed himself, I didn’t know what to do with the information. Now the lid has burst off an explosive human rights and public health issue. “More U.S. soldiers have killed themselves than have died in the Afghan war,” Time Magazine noted in a recent front cover special report. 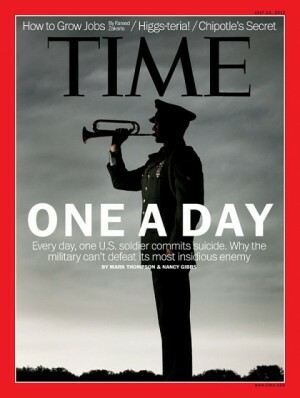 The current military suicide rate is roughly one death per day, Time reported. Meanwhile, military veterans have been committing suicide at a furious clip, about 18 per day. How to stop an epidemic of soldiers and veterans killing themselves in greater numbers than are dying on battlefields has baffled military leaders and the Department of Veterans Affairs. Despite crises hotlines and post-traumatic stress counseling programs, instituted in response to concerns that many soldiers have done multiple deployments in Iraq and Afghanistan, the U.S. military has clung to its Napoleonic attitude that armies are trained for killing people, not fostering healthy citizens. When a young recruit slit his wrists during my Army basic training at Ft. Jackson, SC in the summer of 1962, a drill sergeant screamed at our platoon that he would personally provide razor blades to anybody else who wanted to kill themselves. That hard-boiled attitude didn’t deter soldiers who decided to end it all. The next year, during my tour in Vietnam, suicide was a leading cause of death among the U.S. military expeditionary force—after aircraft crashes and guerrilla warfare firefights. Suicide continued to be a leading cause of death among Vietnam veterans for years. But it was long hidden by the lack of publicly reported statistics on suicides by soldiers and veterans. Despite the rhetoric of concern for the welfare of soldiers by today’s military leaders, little has changed. These days, the U.S. military is revealing it has a very big problem, based on suicide statistics that have skyrocketed in recent years. At the same time, the Marine Corps is court-martialing a Marine who slit his wrists in Okinawa—a punitive action that hasn’t put a damper on the rising rate of suicides, which more than doubled in the Army since 2003 and is heading upward in all armed services this year. Nor was the appalling rate of military suicides reversed by a blistering message from Major General Dana Pittard, a commander at Ft. Bliss, Texas, who wrote “on his official blog that he was ‘personally fed up’ with ‘absolutely selfish’ troops who kill themselves, leaving him and others to ‘clean up their mess,’” Time Magazine reported. Government officials speculate that the alarming suicide rate among veterans in Nevada is due to the region’s high unemployment. Yet that doesn’t explain why other folks also facing a grim and long-lasting drought in jobs but didn’t serve in the military don’t kill themselves at a similarly high rate. Among the worrisome statistics now available is that the majority who killed themselves while on active duty were not in combat. This suggests that U.S. military culture is a big part of the problem, regardless of where one serves. The military attitude is that the solution to international disputes is to whip the troops to continuously train for, supply equipment for, transport and wage endless war in numerous places around the world. Surely this is depleting the ability to cope among a great many exhausted soldiers, whose complaints are ignored. Wartime military culture drums into soldiers, from cooks and mechanics to front-line grunts, that the solution to seemingly intractable problems is to shoot or blow something up and kill somebody. Is it any wonder that so many soldiers who kill themselves shoot themselves? According to Time Magazine’s report, the majority of suicides are committed by enlisted men, whose problems are often attributed by the military to be personal. In the military hierarchy, enlisted men have little voice to speak up for themselves. In a case highlighted by Time, however, the wife of an Army doctor was brushed aside by a military commander when she sought help for her over-stressed husband—who hung himself in March while on duty at Trippler Army Medical Center in Honolulu. Now that wife and other widows and family members are publicly telling the stories of their lost loved ones and pressing for changes in how soldiers and veterans are treated. The total number of U.S. military deaths by suicide since 2001 is now more than 2,600—in contrast to just under 2,000 military fatalities in Afghanistan, Time reported last week. The news magazine did not break down how many of 4,486 military deaths in Iraq were self-inflicted. Among the stories that should be widely heeded is that of the death of Army Colonel Theodore Westhusing, who shot himself in June 2005 shortly before his tour in Iraq was to end, leaving a bitter suicide note addressed to his commanders. “I cannot support a msn [mission] that leads to corruption, human right abuses and liars. I am sullied — no more,” Westhusing, who was 44 and due to return to teaching at West Point, wrote. “I didn’t volunteer to support corrupt, money grubbing contractors, nor work for commanders only interested in themselves. I came to serve honorably and feel dishonored.” Westhusing’s wife told Army investigators he’d conveyed these concerns to her, as well. “I think Ted gave his life to let everyone know what was going on,” she said. Perhaps Westhusing and many others might still be alive, if the U.S. military provided a civics course that encouraged soldiers to speak up about troubling experiences and were attentively listened to in discussing what can be done to improve the situation. In the absence of such action, some soldiers, veterans and family members have been sharing their own stories in public meetings and to the news media and working on climbing out of black holes of despair through art and writings about disturbing experiences in the military and since coming home. In whatever forum or format, speaking out can be life-saving for a soldier or veteran in anguish, as well as for the public to understand what’s going on in our military that’s so devastating. I don’t agree with all of your thoughts. However, I agree more than I disagree. Armies make war not peace. A fact that our present day society seems to over look. Returning Vets find either hostility or the misery of being almost completely ignored. Maybe even both. Not much reward for our hero’s. The fact is, military personnel have been treated in a far more respectful, welcoming, and positive way since at least the end of the first Gulf war, 20 years ago. There’s no comparison with the way those returning from Vietnam were treated, and it’s unlikely to be a factor in the suicide rate. It’s hard to find good statistics, but it seems that now the military suicide rate is higher than the rate among comparable people in the general population. About eight years ago, it was half what it is today and significantly less than the general population. Now it’s twice as high as it was then and higher than the general population. Also, it’s worse in the Reserves and Guard than among Regulars. My guess, based on a lifetime in the Army and knowing soldiers well, would be the stress of frequent, multiple tours to combat zones. That might also explain the higher rates among the Reserves and the Guard, given that many of them joined for the benefits and didn’t expect to be sent into combat, especially on repeated tours. When we say that the military (we’re really talking mostly about soldiers and Marines) has been stretched far too thin by Iraq and Afghanistan, part of what we’re talking about is the effect on individuals. To say that more committed suicide in the recent past than were killed in combat misses the point. The number of combat deaths, especially in Afghanistan, has been exceptionally low, and that makes for an iffy comparison. In any case, fear of death and injury is an issue, naturally, but there is also the stress of living in very difficult conditions, separated from family and friends, and in a hostile environment during repeated tours. The solution to all this is to get the hell out of Afghanistan as soon as possible, if not sooner. Beyond that, we shouldn’t get ourselves into another situation of that sort unless we’re willing to pay the real price of a much larger Army and Marine Corps. I’ve known or heard about Vietnam vets who killed themselves quietly and others with a big bang meant to convey some sort of message to the public. Their deaths were basically ignored. A pernicious myth has been circulating since the early 1970s that Vietnam vets are crazy, so a mounting toll of suicides didn’t trigger much in the way of a public outcry. How that compares to the current suicide rates is anybody’s guess, because stats on Vietnam vets were not kept or were not provided, despite requests by veterans’ groups. I don’t think we’ve seen the full picture yet about what’s happening with the current generation of vets.